Teresita is the CEO and Founder of Divine Affinity, an International Speaker/ Transformational Coach as well as a certified Advanced ThetaHealing® and Reiki Practitioner. Her passion is empowering clients, particularly women, to love and accept themselves, discover their own infinite inner resources to grow, blossom, live their highest dreams, find calmness, and forgiveness and to heal their physical ailments. 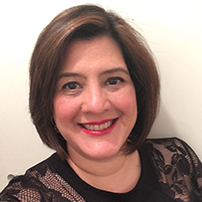 Teresita has reached nearly over 1000 people both nationally and internationally, including 1-1 coaching sessions, workshops, events and social media, using all her passion and experience to help others finding themselves and enjoy their lives to their highest. She experienced depression, fear, money worries, and grieve, after losing her parents, feeling lost and with not direction in life. Her path to recovery led her to a therapeutic approach without any success, until she finally found a holistic technique, that helped her to overcome her fears, worries and much more. She now uses all her passion and experience to help others finding themselves and enjoy their lives to their highest, offering this empowering and transformational healing techniques to others.